Here are a few of my website designs, past and present. An Everclear site. Resources galore. It began in late 1997 as a guide for the mailing list of the same name. I received some help with funding in late 1999, which allowed for a major expansion and a move to its own domain. Prog-rock/math-rock band from Boston. Singer/guitarist Reuben Bettsak is an old friend of mine. 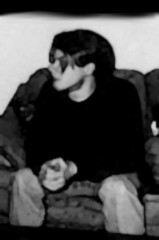 He played in my band Stoneykirk back in 1995, and I played in his old band The Little Dipper back in 1999. This is the old Little Dipper website. Reuben asked me to build a website for the Hartford-based band back in 1998. In early 1999, they tossed their lead singer right before a week-long Spring Tour. Since I was still in touch, and I was available, I packed up my stuff, drove to Hartford, and performed with the band for a couple of months. It was a ton of fun. We wrote a couple of amazing songs that I included as bonus tracks on Once Every Never. The site hasn't changed much since the band became The Nationale Blue in early 2000. My first website. I pieced it together during the summer of 1995 as a way to learn HTML. I had a bunch of Nirvana photos from old magazines - I figured it was worth a shot. Not long after graduation, I rebuilt the page and moved it to a free Xoom account. It hasn't been touched much in the years since. Sells vintage watches. The functioning watch on the front page is my first and only foray into Java.